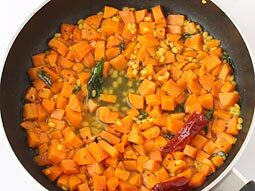 It is a simple and healthy dry textured South Indian (more specifically Tamil style) curry prepared using carrot, moong dal and coconut. 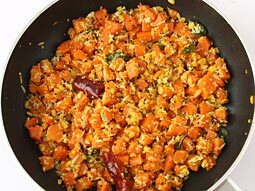 It’s one of the easiest Indian recipes wherein chopped carrot is stir-fried with spices and paste of chillies, cumin seeds and freshly grated coconut. Simple yet delicious! 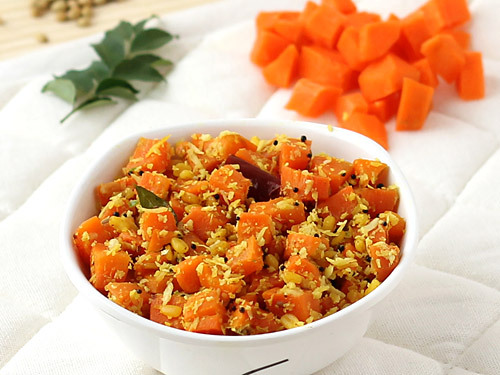 For those who are not familiar with South Indian food, carrot poriyal is also know as carrot palya in Karnataka. 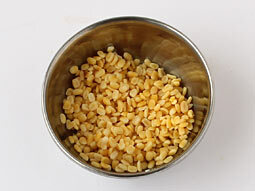 Soak moong dal in water for 10-minutes. Drain excess water and keep aside. 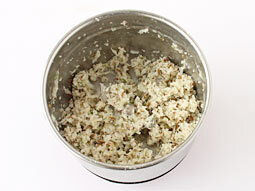 Take grated fresh coconut, chopped green chilies, cumin seeds and 1-tablespoon water in a grinder jar and grind until medium coarse paste. Heat oil in a kadai over low flame. 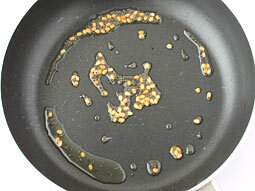 Add mustard seeds and allow them to sizzle. 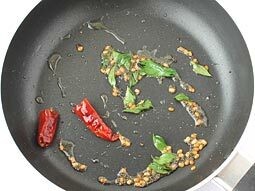 Add urad dal and sauté until it turns light brown. Add asafoetida, dry red chili and curry leaves. 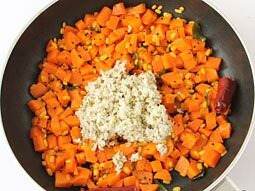 Add drained moong dal, turmeric powder and finely chopped carrot; stir-fry for 2-3 minutes. Add 1/3-cup water and salt to taste. 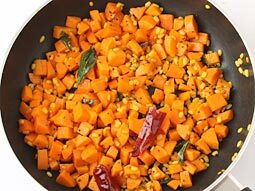 Cover it with a lid and cook over low flame until carrot turns soft but not mushy (add few tablespoons more water if required); stir occasionally in between. Mix and cook over low flame for a minute. Turn off flame and transfer it to a serving bowl. 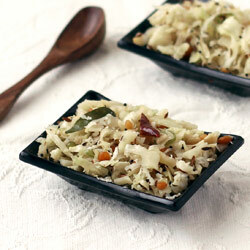 Serving Ideas: Serve it as a side dish in lunch or dinner. 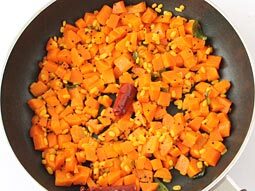 It can also be served with chapati or phulka as a healthy meal. Your receipes are easy and simple to follow. I need your new recipes. Must say a good, tried now at 08:30.